Following the recent news that Marvel will be giving us a bunch of Conan variants in Dec/Jan; I thought now was a good time to spotlight our favorite Barbarian. I am looking forward to the new series by Jason Aaron, Mahmud Asrar, and Esad Ribic. We should all keep our eyes peeled for a couple awesome Conan covers from late in the run of the original Marvel series. So as you flip past all those old Conan books you may not care about in the bins, file this McFarlane image in your mental rolodex. It’s worth the effort. How do you follow a McFarlane Conan cover? Why, with a Jim Lee cover of course. So this is another issue that Marvel used their top end talent on for this 3 part crossover with Red Sonja. If you have them in the stable, why not use cover art by one of your big guns? This was 1991, just before the boys decided to bolt to start Image Comics, so this was at the height of their popularity. So be on the lookout for this bad boy while you dig. It would be a good idea to also look for #243 which is a Whilce Portacio cover. The final part of this storyline and another book worth picking up if the opportunity presents itself. Had NO idea about either of these, great tip, thanks Peter!! same here, never saw either of these covers but i’ll keep my eyes peeled now. Hot tip from Ronan Kan over in G+, keep a look out for #237 Mignola and #248 Art Adams as well. I bought the dead stock from a newsstand that went out of business in the 90’s. I have probably 20+ copies of Conan 240-255 or so, all newsstand. I thought they were $ books. Thanks for the info! Great stuff, here Peter…. appreciate the work! Another hot tip and shout out to Joe Winfree on G+ who pointed out Jim Lee did 2 other covers on Conan to keep on your radar. Issues 218-219. The Whilce one is very nice as well! 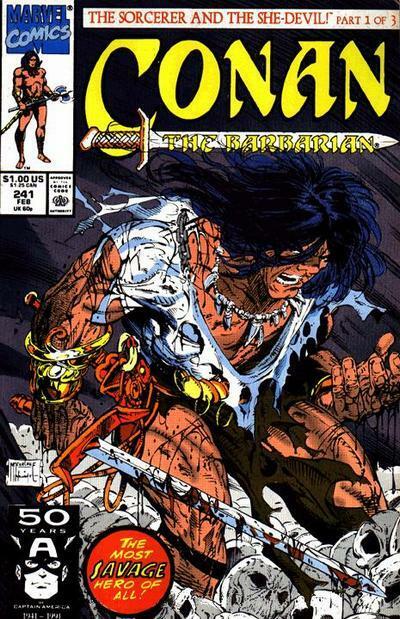 Marc Silvestri’s first Marvel comic was Conan the Barbarian #135, too. Awesome, another good tip. I’m loving the free flowing of information. It gives us all more books to hunt. I appreciate all the comments and for you guys taking the time to drop a quick note. Hope you guys keep this up going forward. I only put up 2 books each week, but there are tons of worthwhile books we should all know about. With so many new collectors joining the hobby, let’s keep sharing and informing as this keeps the hobby strong. Not everyone can afford to play in the big boy yard. I know there’s plenty more like me who like playing in the cheap spec, treasure hunting the dollar bin game. Great article Peter, I really love your write up and this one is up there as well. BTW it was a pleasur speaking to you today at the comic shop ( Comic Relief). Keep up the great work Sir! Thank you sir. And good meeting you too buddy. It was nice taking a timeout from work and BS-ing about books. I look for any excuse to start talking comics. Thank you for the info!!!! !Great as always!